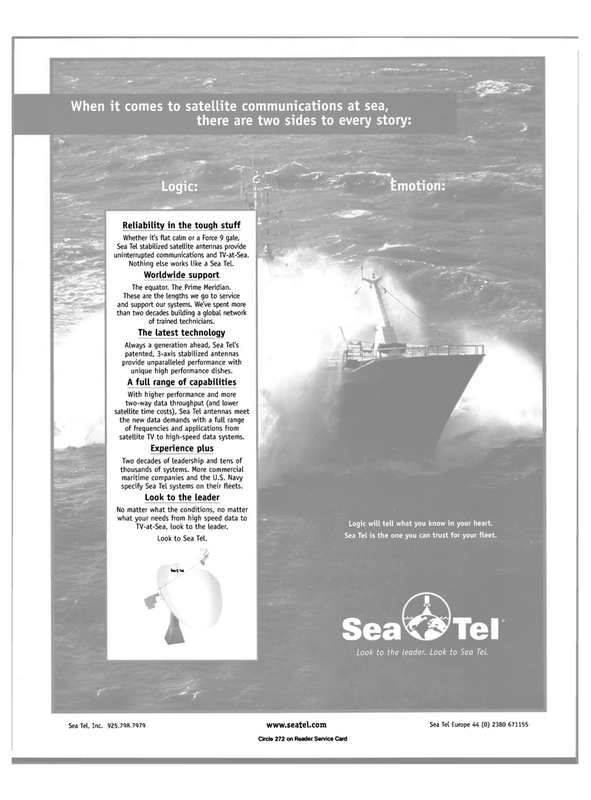 Sea Tel stabilized satellite antennas provide uninterrupted communications and TV-at-Sea. Nothing else works like a Sea Tel. The equator. The Prime Meridian. These are the lengths we go to service and support our systems. We've spent more than two decades building a global network of trained technicians. Always a generation ahead, Sea Tel's patented, 3-axis stabilized antennas provide unparalleled performance with unique high performance dishes. With higher performance and more two-way data throughput (and lower satellite time costs), Sea Tel antennas meet the new data demands with a full range of frequencies and applications from satellite TV to high-speed data systems. Two decades of leadership and tens of thousands of systems. More commercial maritime companies and the U.S. Navy specify Sea Tel systems on their fleets. TV-at-Sea, look to the leader. Logic will tell what you know in your heart.